The phenomenon that is #ClemensFest 2012 will continue early next week when he visits York. While it’s been confirmed Roger Clemens will not pitch in a game against the Revolution at Sovereign Bank Stadium, he will be taking the hill. It’s been announced that Clemens will throw a “bullpen” session on Tuesday, but on the main mound at the ballpark in preparation for his second start for the Skeeters, which will be Friday, September 7 in Sugar Land against the Long Island Ducks. If you have a ticket to Tuesday’s game, you’ll be able to come in at 4:45 p.m. to watch Clemens’ workout. The entire press release about the event is pasted below and after the jump, so check it out for all the details. Speculation continues to swirl around what the future holds for Clemens, as word as also broken the Astros will scout his next start, as they apparently did his first one. If he pitches well against the struggling Ducks, a big-league return during the final month of the season may become a reality for the 50-year-old Clemens. 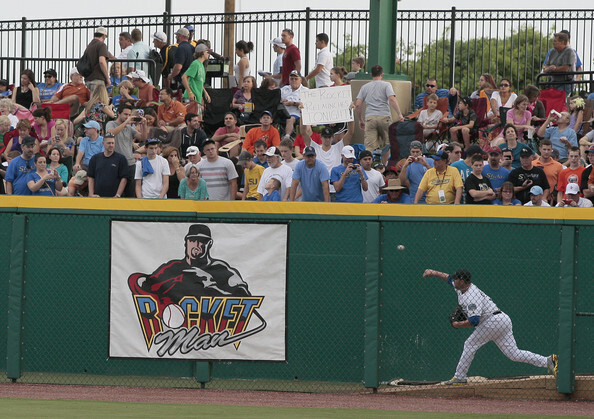 Stay tuned, and see you on Tuesday for the most anticipated bullpen session in Sovereign Bank Stadium history. OH MY GOODNESS GRACIOUS: Roger Clemens will make a roadtrip with his new teammates after all. For those of you that got the Suzyn Waldman reference there, why then you have the memory of an elephant. Kudos. 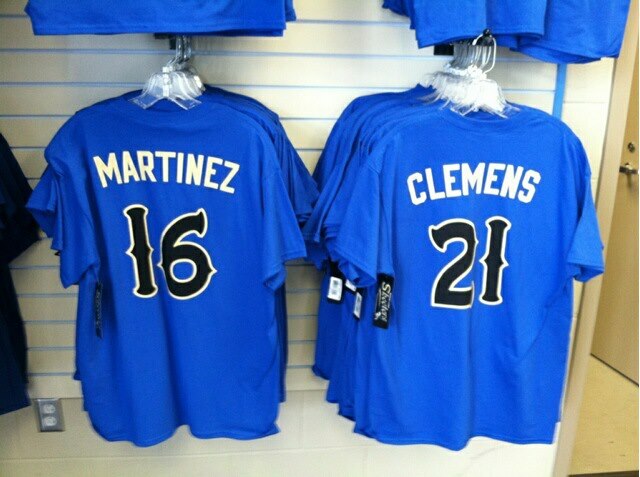 Clemens is scheduled to be with the Skeeters for the first two games of the series in York on Monday and Tuesday. According to the Skeeters, he will then depart back to Texas to get ready for his next start. Should he pitch on 9/7 as scheduled, that would be a 12-day layoff from his previous start last Saturday against Bridgeport. 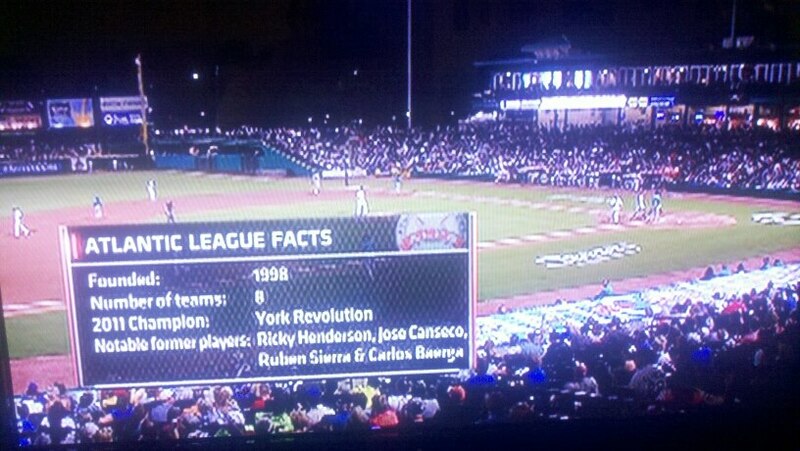 One could infer that with Clemens scheduled to go on Friday, he will not pitch against the Revolution in York. We’ll see…how about an inning out of the bullpen? Let me make it clear that nothing like that has been mentioned to me. I’m just saying that would be pretty cool. That link also contains the full press release from the Skeeters. When MLB rosters expand to a maximum of 40 active players from 25 on September 1, four former Revolution pitches currently in Triple-A will have their fingers crossed they get the call to the big leagues to finish the last month of the regular season. Of course, teams never call-up 15 additional players, but rather a handful. Five to seven usually. Click for the most up-to-date stats for each guy. Should anyone be called up, we’ll have the news for you right here if/when it happens throughout the month of September. Hampson was already called up for a three-game cup of coffee with the Mets earlier this season in June, before being re-assigned to Buffalo. The Mets were the third MLB he’s played for, in addition to Colorado in 2006, and San Diego in ’07 and ’08. His call-up to New York marked his return to the big leagues after a four-year absence. DeMark, who has previously reached Triple-A with San Diego before playing in York, is striving to make his Major League debut with Arizona. He is tantalizingly close. Like DeMark, Rice is inching closer to his Major League debut. What’s frustrating is that Rice was in big league spring training throughout February and March, and pitched so well it took manager Don Mattingly until the final day to decide who would be the last lefty kept in the Dodgers bullpen. That spot went to Josh Lindblom, who is now with the Phillies after he was included by LA in the trade deadline deal for Shane Victorino. With all the transactions and blockbuster trades the Dodgers have made of late, it feels like Rice has gotten lost in the shuffle. He is very deserving of a September call-up, especially after being so close to making the big league club right out of spring training five months ago now. Through five scoreless starts with the Revolution this season, Hill set a club record for consecutive scoreless innings with 27.2 before being picked up by Toronto. It’s the home-Provence organization for the Ontario native. Rebounding from injury, the Blue Jays are the most recent team Hill suited up for in the big leagues, back in 2010. Hill has played in parts of six big league seasons with Montreal/Washington, San Diego and Toronto between 2004 and 2010. His 9-1 record in 13 starts for Las Vegas, coupled with the endless injuries the Jays have suffered to starting pitchers this season makes Hill the most likely call-up. Nothing is a sure thing though, and here’s hoping all of these guys get their opportunity, especially DeMark and Rice as they look to make their MLB debut. It’s not every day that you get to catch a 300-game winner and seven-time Cy Young Award winner. But former Revolution catcher Octavio Martinez did just that on Saturday Night. He even directed the Skeeters to a 1-0 win to boot, after Clemens exited after three and a third scoreless innings, allowing just one hit and no walks, striking out two in his first start in five years since he was a Yankee in 2007. After catching for the Revolution during the 2011 championship season, Martinez was snapped up by Sugar Land in the off-season expansion draft. The starting pitcher and catcher always go over things prior to the game, but I have a feeling this meeting will be a lasting memory for Octavio. 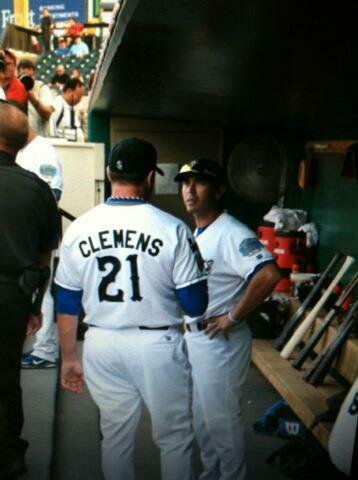 Hopefully, he’s explaining to Clemens that he doesn’t like it when a pitcher shakes him off. His face looks pretty serious. Honestly, I’d rather have the Martinez shirt. There’s just something about having your t-shirt jersey being sold next to the Roger Clemens one in the team souvenir shop that is almost as cool as actually catching him in the game. Pretty surreal. I enjoyed watching all the former Revs in the game (Martinez and Michael Nix with Sugar Land, Kennard Jones with Bridgeport), but it was great to see so many familiar faces in the spotlight, even if it was just for one night. Who knows if ESPN will broadcast any additional games Clemens pitches for Sugar Land. Leading up to Saturday’s Bridgeport-Sugar Land game being broadcast in its entirety on ESPN Classic, I was facetiously asking why ESPN wouldn’t broadcast an Atlantic League game from Sovereign Bank Stadium, considering the Revolution had won the league title the last two years. 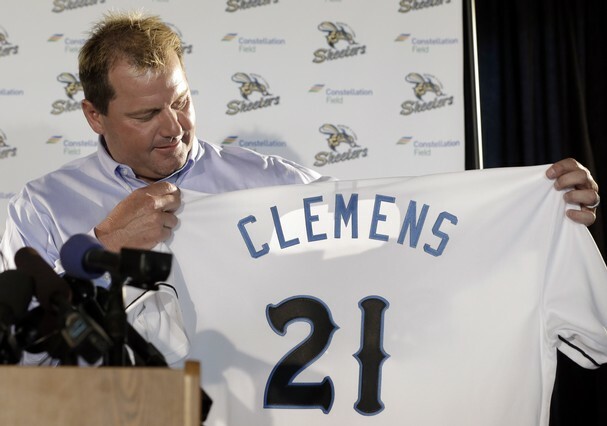 Okay, so the Skeeters signed Roger Clemens. 3/5 of York’s rotation also pitched in the Major Leagues (Corey Thurman, Ryan Feierabend, Chris Waters), so what’s the big deal? I kid, I kid. I was pacified though, when the ESPN crew was going over some facts about the Atlantic League. We did get a shout out mid-game, accompanied by this screen graphic. I was a little disappointed they didn’t mention the Revs had won the last two ALPB titles, but I was still pumped to see and hear our name on national TV. So much so, I am over-looking the fact that ESPN spelled “Rickey” Henderson’s name wrong. Former Revs-turned-Skeeters Octavio Martinez and Michael Nix also got some awesome face time as well, as Nix entered to relieve Clemens in the fourth, with Martinez catching the whole game and the seven-time Cy Young winner. This was actually the second time the Revolution has gotten some pub on an ESPN Network. Some of you may remember Brooks Robinson giving an interview on Mike & Mike in the Morning in 2008, prior to his statue being unveiled outside our ballpark. A couple days before, I remember UPSing Greenberg and Golic personalized Revolution jerseys, and Golic actually wore his the whole show. That was a great day for the Atlantic League, as was last night’s 1-0 Skeeters win over the Bluefish on live, national TV. It’s an exciting time to be in the league. 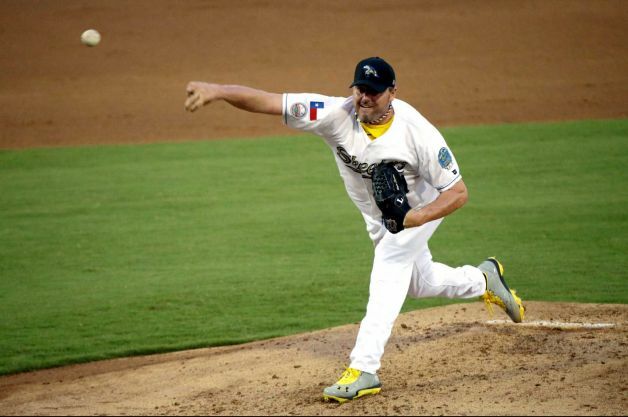 Now that the media attention around Roger Clemens signing with the Sugar Land Skeeters is coming to a head with his start on Saturday night, I’ve gathered up a few miscellaneous facts and opinions. No matter what your opinion is of Clemens, there is no doubt this week has been tremendous for our league from an exposure standpoint, which benefits all the clubs, not just Sugar Land and Bridgeport, their opponent this weekend. So good for Karen, and she’ll have tons of fun over the next six months ordering brand new signage for what basically amounts to a brand new ballpark. Pretty cool. Adding to all those fresh signs is a total re-branding effort by SWB, who will still be affiliated with the Yankees, but will no longer be called that. Apparently “Yankees” as a nickname has alienated a few Phillies fans in the greater Scranton area. Go figure on that one. SWB rolled out finalists for their new moniker this week to be voted on by fans, which stirred up good memories of when “Revolution” beat out such competitors as “Choppers, Dukes and Steel Horses.” Not a bad bunch, but I’m glad Revolution won. Below and after the jump are the names and explanations for our soon-to-be-renamed Pennsylvania neighbors to the north, taken from the official team release. My comments on each are in bold. For SWB, this will be their third name since 2007. 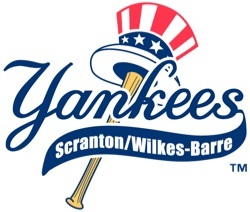 Phillies fans will remember that prior to their top farm club becoming the Lehigh Valley Iron Pigs, the Scranton/Wilkes-Barre Red Barons were a Phillies affiliate for years until the franchise went to the Yankees after the 2006 season.